In most Discourse forums I visit, under your own user settings, in Email, there’s usually a section called “Activity Summary”. This allows me to receive emails once a week of what’s been happening in the forum. I don’t see this feature here. Is that on purpose? Is there any way we can get that feature? Untrue? No. 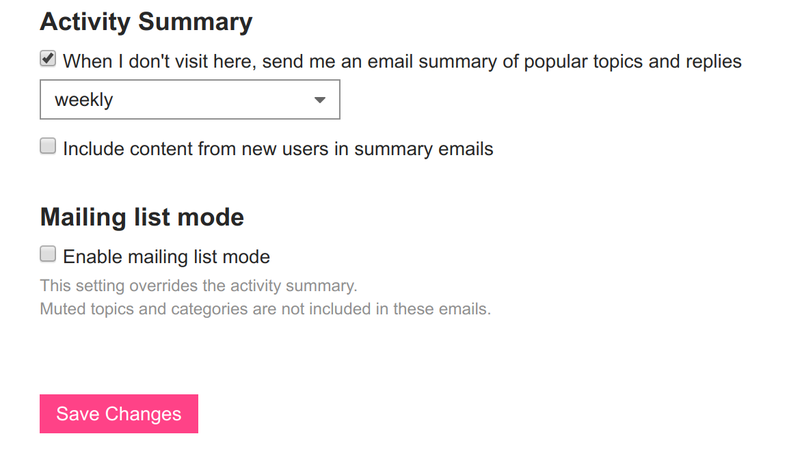 Mailing list mode is a different option. We globally switched it off early on in the setup of the site because we had some complaints. I’m happy to turn it on, and announce on the forum how people can individually turn it off again. Here’s a suggestion, you can turn that feature back on, and then there’s another setting called default email digest frequency which is by default set to weekly I believe. You can change that to never. That allows you to turn the feature on and no one will get those emails unless they manually set a frequency like I will. I’m not sure if that takes effect right away or only for new users though.